Four Fresno firefighters are being hailed heroes for saving three young children -- the newly released dramatic video that takes you inside the rescue. 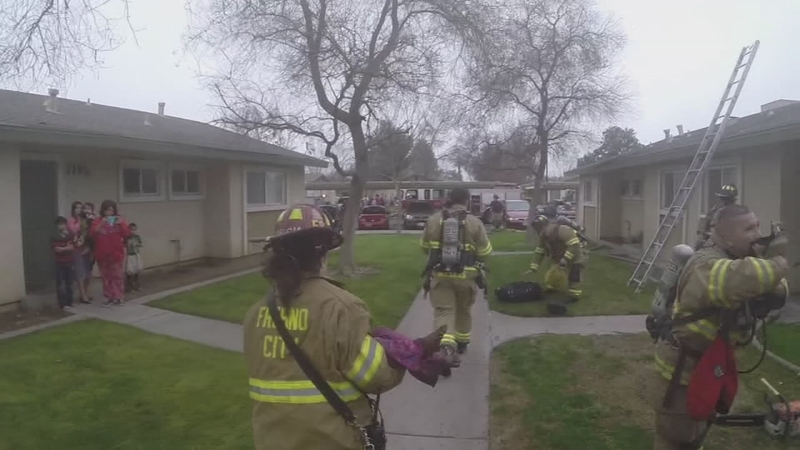 FRESNO, Calif. -- Four Fresno, California firefighters are being hailed heroes for saving three young children -- the newly released dramatic video that takes you inside the rescue. Firefighters found the three young children on Sunday in a Southwest Fresno apartment without their mother. At last report, those three children are still in critical condition. Action News spoke with the captain of the fire team. Smoke barrels out of a burning apartment as a mother screams for her children. Firefighters found the three young children on Sunday in a Southwest Fresno apartment without their mother. Those three children are still in critical condition. Action News spoke with the captain of the fire team in an interview you'll only see on Action News. "You start thinking about it. You look at your kids you look at your friends children and the images come back," said Fresno Fire Captain Christian Palmer. It's pitch black and Captain Christian Palmer and his team make their way into the apartment. They pass a small electrical fire while they search for the three young kids. "The mother had given us a general direction of where the kids were to be located. It's zero visibility inside the building so we're kind of using, we're feeling down the wall trying to recognize objects," said Palmer. One-by-one the three young children are saved, covered in soot and knocked unconscious from the toxic smoke. Fresno Fire Chief Kerri Donis said her firefighters are heroes, even though they'll never admit it. "They're just dedicated men and women. Very selfless. And as a community we should feel very proud and secure," said Donis. "It makes you proud to know that hopefully you're making a difference," said Palmer. The three children are under the care of child protective services while the Fresno Police Department investigates where the mother was during the time of the fire.